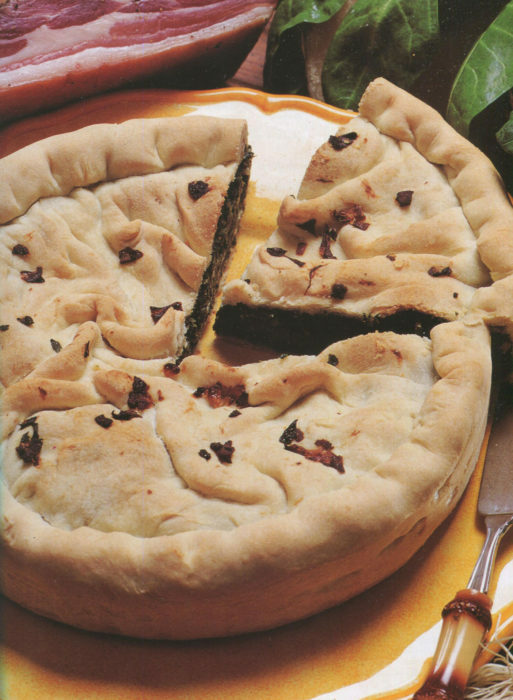 The name here says savory pie but it really is a spring vegetable pie from Northern Italy. And, the crust uses lard. Do not freak, do not substitute. Go in search of lard and discover how different and grand pie dough can be. Yes, people will tell you lard is unhealthy. If you ate a lot, every day, they might have a point. This is a modest amount and you might make this dish once a year. Well, maybe twice and you are not going to eat the whole pie. That crust, as you can see in the picture, is not “light and fluffy.” It is peasant crust meant to contain a large pie, offer resistance to the fork, and satisfaction to your bite. It will. This is a perfect Italian introduction to spring. Wash the chard or spinach leaves well, but do not dry; cook for a few minutes with just the water left clinging to the leaves. Squeeze out as much moisture as possible and chop very coarsely. Chop the pancetta finely with parsley, garlic, and scallions or shallots. Sauté in a lightly greased skillet (frying pan) until the onion is tender. Set 1 tablespoon of this mixture aside. Leave the rest in the skillet and add the chopped green leaf vegetable, parmesan, salt, and pepper. Stir well. Sift the flour and a dash of salt in a mixing bowl. Make a well in the center and pour the melted lard into it. Gradually stir in the flour, adding a little warm water at intervals, to form easily worked dough. Divide it into two parts, one larger than the other, and roll out into two disks. Use the larger one to line a deep, greased 9½ inch diameter pie pan. It should overlap the edges a little. Fill with the prepared mix then smooth this level. Cover with the other disk, sealing the edges well. Spread the reserved 1 tablespoon of fried mixture over the surface of dough. Bake in a preheated oven at 400°F for 30 minutes. This savory pie is best served warm rather than hot.